Codling moth (CM) -- too early for CM status report; 1st generation 3% CM egg hatch: June 13, Friday = target date for first spray where multiple sprays needed to control 1st generation CM. Redbanded leafroller (RBLR) -- Peak trap catch and approximate start of egg hatch: May 10, Saturday. San Jose scale (SJS) -- First adult SJS caught on trap: May 24, Saturday; 1st generation SJS crawlers appear: June 21, Saturday. 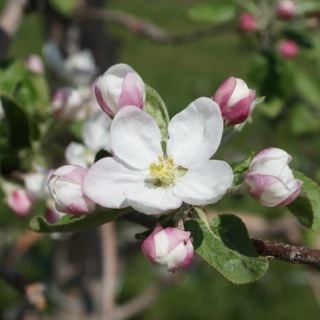 As usual, we get some nice weather which brings apple into bloom, then the weather goes downhill from there. Such appears to be the case again this year, particularly towards the end of the week. In eastern Massachusetts, I expect it to be cooler and less conducive to pollination than in the west. One upside to this is the risk of fire blight is reduced in cooler weather. Speaking of which, my internet was down all day Monday, I was going to get out a quick note about fire blight risk but could not. I don't think it is a big issue yet, as we've only had a day or two (depending on location) with open bloom and warm temperatures. (OK, maybe 3-4 days for some of the earlier orchards.) On Tuesday morning, the NEWA Cougarblight model for Belchertown was pretty minimal risk until later in the week when it ramps up a bit. You have to check daily, however, as the forecast changes daily this time of year. (Doesn't it?) Remember, you have to have: open bloom, warm temperatures for several(?) days, and precipitation or heavy dew (how much?) to bring on fire blight infection. That is perhaps an over-simplification, you should always check NEWA for the best result. Based on my gut feeling on above, and NEWA, I don't see any good reason to rush out and apply streptomycin unless it makes you feel much better. Towards the end of the week, it might be a different story as precipitation is more likely. The risk of apple scab infection also ramps up considerably towards the end of the week. Note that IF the forecast holds, this might be the last of ascospore maturity and release that causes primary infection. 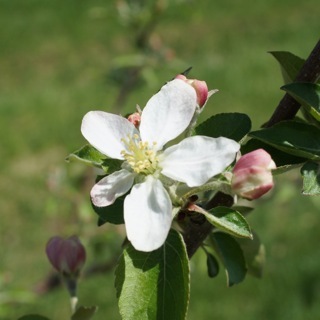 Other than that, I am seeing a rather lackluster apple and peach bloom in Belchertown, so apple thinning will be difficult (or easy, depending on your perspective -- what else is new?) and I don't see us having to do much hand thinning of peaches. I am concerned there is significant ovary/style/stigma damage to peach buds despite having petals. Apples are all over the place, but Honeycrisp looks off, Cortland looks medium, Macs are variable, but Gala seems pretty good (for now). It usually turns out much better than I think (cup is always half-empty) so let's hope so. I am not optimistic our weather pattern for the late spring and summer is going to be anything but challenging, so let's wait and see on that too -- hopefully I am wrong. As always, reports as to what you are seeing and feeling are welcome. 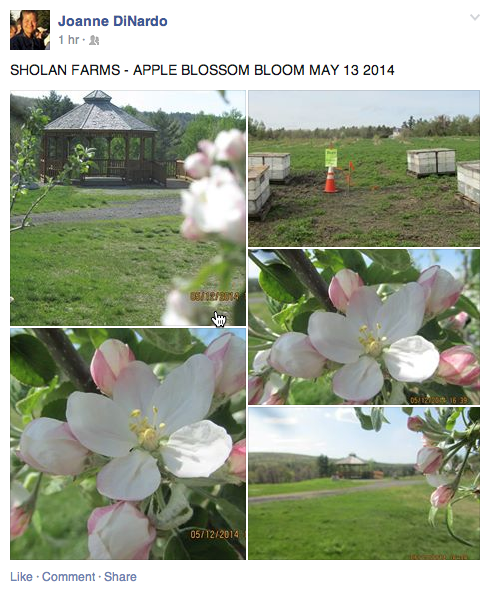 I hope to see you at the twilight meeting at Dowse Orchard this Wednesday (May 14) evening. Not much to report here other than what is included in AgRadar above. Be very careful when applying pesticides preceding and during bloom, and during petal fall. Also, see Guest Article I on the subject of NEWA. If you are not using and becoming familiar with (or AgRadar), you should take the time to study and use it. 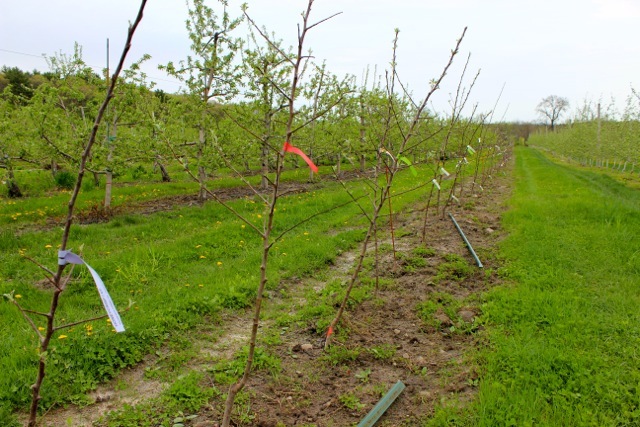 It's integrated pest management (IPM) for the future N-O-W.
Apple scab spores were released during the May 9 rain event and the May 10 event, according to the "MacHardy two fan spore trapping device" that is being tested in Belchertown at the UMass orchard. Ten fields were examined on each slide at both 200 and 400x on the slide from the 5/9 event 103 mature ascospores were observed. On the slide from the 5-10 event 81 mature ascospores were observed. In addition ten perithecium, from overwintered infected apple leaves, were placed into a squash mount slide, many mature ascu filled with mature ascospores were observed, as well as empty asci. Surrounding the perithecium with empty asci associated with them (six separate perithecium) 26 ascospores were observed. An examination of ten fields at 200x from a petri plate assay of five overwintered, infected apple leaves revealed 22 mature ascospores. We continue in a high-risk periods for apple scab. The rain from last Friday, May 9, through the weekend was not heavy, but it was a long infection period. A large percentage of the season’s ascospores were released, all adding up to a very heavy infection period. Another heavy infection period is predicted for the end of this week. Both models and our observations continue to show plenty of scab inoculum available for it. Rain will probably start as showers on Thursday, with a high probability of rain on Friday and Saturday. Showers and rain could continue into next week. That’s a long wetting period. This is NOT the time to stretch fungicide coverage. Review last week’s Healthy Fruit for our advice on using protectants going into long rainy periods. Scab from the infection period that occurred April 29 – May 2 should start to become visible as early as May 14, and if infections occurred lesions will definitely show by the end of the week. It’s a good time to check scab-prone areas of orchards to see if scab infections occurred. In varieties that are susceptible to powdery mildew and where mildew has been a problem in the past, use a mildew fungicide in this week’s applications. Rally and Topguard are excellent mildew and rust fungicides, but are not the most effective scab fungicides. Scab efficacy and mildew efficacy are virtually reversed. Scab is undoubtedly the larger problem at this point, so if using a DMI, select one with high scab efficacy such as Rally, Procure or Indar. Other systemic fungicides including Sovran, Flint, and Fontelis have good efficacy and will give adequate mildew control under typical situations in Massachusetts. Remember to mix any systemic with an EBDC or captan. Speaking of captan, NY plant pathologists have recommended against using captan in early-season sprays, particularly around bloom. This is because some pesticide formulations appear to have enhanced systemic uptake, or have adjuvants that improve absorption into plant tissue. If captan is taken into plant tissue, then it can damage it. It’s the same situation that happens when oil and captan are applied together, or too closely. Since interactions between some new chemicals and captan are not really understood, the NY pathologists thought it best to recommend that growers not use captan when mixing with systemic fungicides, insecticides or growth regulators, particularly around bloom and petal fall. The alternative protectant at this time would be one of the EBDC fungicides. As we move into bloom, be ready for fire blight. Showers and temperatures in the mid-60’s and 70’s are ideal for blossom infections. The models are predicting extreme risk of fire blight in all parts of the state starting with the next rain event. A streptomycin spray should be made to high-risk orchards in the next few days. High-risk orchards include pears, orchards that have had fire blight in the last 2 years, or are next to orchards that have had fire blight in the last 2 years. Any trees that are under 6 years old are also considered high risk. Apple cultivars vary in their susceptibility, and the most susceptible cultivars are also high-risk. There’s a table of fire blight susceptibility on the West Virginia University web site: http://www.caf.wvu.edu/kearneysville/tables/fbsus.html . The decision of when to apply strep also depends on whether blossoms are open. Strep protection is limited to blossoms that are open at the time of an infection occurs, usually when it starts to rain. As more blossoms open, then a second application needs to be made. 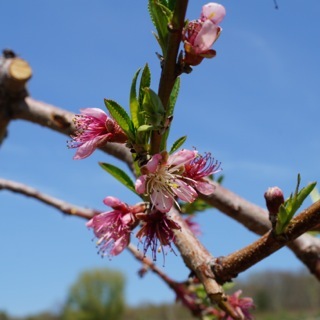 When blossoms are opening rapidly, it may be necessary to reapply strep within a couple of days of the first application. The Cougarblight model on NEWA can guide growers on this. For example, if I applied strep to a block at Cold Spring Orchard tomorrow morning, I can enter the date in the box for streptomycin applications on NEWA. Cougarblight then predicts the risk of infection will return to “High” by Friday. The recommendation for streptomycin is 24 oz./acre. In fact, the target is a concentration of about 100 ppm. The labels for Agri-Mycin, Ag Streptomycin, Firewall and similar products have a range of 24 to 48 oz./A. However, the fine print says that the 48 oz./A rate is for larger trees, by which they mean 600 gal./A size trees. We don’t have many of those in Massachusetts. So for streptomycin, we recommend mixing at 8 oz./ 100 gal., and spraying as dilute a rate as is practical and getting thorough coverage. Regulaid (1 pint per 100 gal. of finished spray – DO NOT concentrate) will enhance strep uptake. It will also enhance the uptake of other chemicals, so once again, be careful around captan, and be aware it will enhance thinner uptake if applied close together. keep water on when at all dry! Also, see Guest Article II on using Apogee to help prevent fire blight, keep more fruit on the tree, and limit excessive vegetative growth. It's a BIG mistake to plant swarf apple trees and not supprt them ASAP! 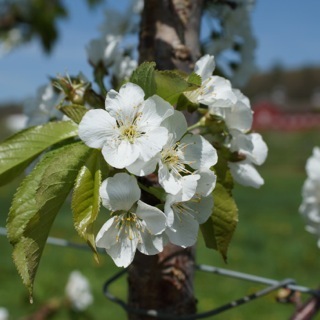 Many orchards have now progressed to the stage where some insecticidal protection is typically needed, and this week's warmer-than-normal predictions could very well complete the transformation from a slow start to a healthy trot. Once again, we would point out the opportunity for testing out the predictive accuracy of our historical records combined with the best biological projections we can offer, by checking out the NEWA Apple Insect Models website. Insect pest developmental stages are calculated from Degree Day (DD) accumulations at IPM's NEWA and National Weather Service airport weather stations throughout the state, as well as a large number of sites in MA, VT, and NJ, plus several in CT, RI, PA, and DE. The insect pests addressed by this website are: apple maggot, oriental fruit moth, codling moth, plum curculio, obliquebanded leafroller, and spotted tentiform leafminer. Disease predictions are available for apple scab and fire blight, and summer diseases (sooty blotch and flyspeck). Access to the Apple Insects (and Diseases) models is through the "Pest Forecasts" list or the "Apples" link on the NEWA homepage (http://newa.cornell.edu). From the Apples homepage, clicking on the link that says "Apple Insect Phenology Models and IPM Forecasts" brings up a state map showing the available weather stations, plus pull-down menus on one side. After the user selects a weather station, pest of interest, and the desired end date for weather data accumulation, pest DD models and historical records are used to calculate: Tree Phenological Stage, Pest Stage(s), Pest Status, and Pest Management Information, all of which appears on a "Results" page. The phenological stage can be adjusted according to field observations by selecting from a pull-down menu; this will generally change some of text provided in the advice boxes. Hyperlinks on this page can take the user to various other online resources, such as color photos of the bud development stages, NYS IPM Fact Sheets of the pests in question, and when appropriate, sampling charts for use in conducting field samples of specific pest life stages (e.g., eggs, larvae, mines). When a pesticide spray is recommended, a "Pesticide Information" link in the "Pest Mangement" box takes the user to the Pest Management Education Program's (PMEP) Tree Fruit IPM home page, where a pesticide decision filter helps users pick an appropriate material to use, based on anticipated pest severity and program type. We are also working with a colleague at Penn State to incorporate a least-cost calculator function, to provide users with an estimate of how much they'll have to pay for given pesticide choice. A pesticide search returns a series of profiles of all the NY-registered products fitting the specified pest species and efficacy rating. The profile gives the common and trade names, labeled use rate, re-entry and pre-harvest intervals, and EPA registration number of each product. Also included are some general remarks on the range of product efficacy, and any known effects on beneficial species. A "Details" link in each profile takes the user to a more extensive list of information, including notes on the active ingredient (including its mode of action classification), an overview of recommended use periods, and a link to a scanned copy of the NYS DEC-approved product label, which can be read or printed out. All of the information presented is already available online at various other Cornell fruit sites, but this website brings these resources together in one place that is more convenient and efficient to access. Predictions provided by the website can be refined and adjusted to reflect current insect activity by user-entered events obtained through field monitoring (such as pest biofix; i.e., the first sustained flight of a pest species). The pesticide selection filter uses Cornell University product efficacy ratings and the type of management program selected by the user (i.e., conventional, reduced-risk, non-organophosphate, organic). The website uses DD information based on either historical records or user-entered biofix data, and includes: the start, peak, or progress of the oviposition or egg hatch period (for CM, OBLR, OFM, and STLM); the start, peak or end of the pest's 1st, 2nd, etc., flight (for AM, CM, OBLR, OFM, and STLM); the first occurrence of adult or larval feeding, foliar or fruit damage, or mines (for OBLR and STLM). 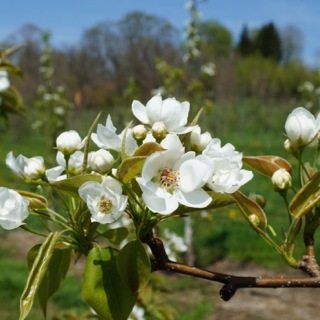 One of the main reasons for using Apogee is for the prevention of the shoot blight phase of fireblight on high value apple cultivars. Consider Apogee use on high value fireblight susceptible cultivars especially when they are grown on fireblight susceptible rootstocks. You have to begin applications early, however, from king bloom to petal fall (1-3 inches of growth). Timing – its time for the first application if you are in bloom! Rate Calculation is essential- make sure to read Section two on the Apogee label, regarding application rate. Determine the size of the tree and the amount of water needed for a dilute spray to drip, according to TRV-tree row volume. Multiply the Apogee rate per 100 gallons of dilute spray by the size of the tree in gallons per acre, the result is the number of ounces needed per acre. Do not use Apogee on Empire and perhaps Stayman apple cultivars: Apogee can cause fruit corking and cracking when applied to Empire. The occurrence of this injury is sporadic, and the circumstances that lead to expression of the injury are not known, however, it has occurred across several years in Michigan, New York, Ohio, and Pennsylvania and NJ. Apogee has been applied to many commercially important varieties, but Empire and Stayman are identified as being sensitive to Apogee. If your water is high in calcium carbonate the water may need to be conditioned. Add one pound of ammonium sulfate (AMS) for every pound of Apogee. Use high quality, spray-grade AMS to avoid plugging nozzles. Use the lower rates of Apogee 3-4 ounces/ 100 gallons, to reduce undesirable effects on fruit set. Note: We suggest growers will get a better result by adding a water conditioner to the spray tank before mixing Apogee, even if the water source is already soft. Note that Apogee should not be applied the same season with PGR’s that contain Gibberellic Acid; sthese include Provide and Promalin. They may interact and prevent one another from working effectively. The next Healthy Fruit will be published on Tuesday, May 20 or thereabouts, 2014. As always feel free to get in touch with any member of the UMass Fruit Team (http://extension.umass.edu/fruitadvisor/team-members) if you have questions or comments.